I so agree, congratulations to your kids and of course to you. Your loving guidance is what makes them better children! Thanks for joining CC. It's in the genes :-) ..... but I definitely agree with Chubskulit, your guidance contributes to their success.... Congrats!!!! Oh is it? Hahaha! Thanks Yannie. Sometimes, our kids already have their inborn talents, but as parents we have the duty to cultivate them so it would come out and be put into practice. Super galing! Ang daming medals nyan ah! I love it! Happiness talaga ang mga kids mo Krizza. very well said Sis :) ako man aba!! maiiyak siguro ako araw araw pag nakikita ko yan!! >> you must be really proud!!! Our kids' accomplishments make our hearts swell with pride and happiness. Visiting back! I'm your new GFC follower, too. I hope you can follow back! wow really you are the successful and happy mother. I wish your babies success more and more. You are a proud mom! Those medals are awesome! 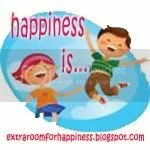 thanks for linking up to Happiness Is! Naku ang gagaling naman pala ng kiddos mo sis... Surely proud na proud ka sa kanila. This goes to show na talagang napalaki mo ng maayos ang mga anak mo. haha.. May inayos lang kasi ako sa design kaya saglit kong hindi muna binuksan. Okay na open na siya ulit. Ayoko kasing mkta nyo yung chaka itsura habang inaayos. Yung sa blog analytics, di ko pa din magets. Pakiinstruct ako ulit. Email me. Muahness! Hi, Kriz! You must have landed on my blogspot blog (http://www.tetchafiguerres.blogspot.com). I migrated that blog to WordPress early last year, and this is the new URL: http://www.pensivethoughts.com. Here you'll find my GFC widget and my Happiness Is... post. You might have noticed that in the old blog, my last post was written last year pa. Sorry for that! WOW! Ang bongga Krizz! You must be one proud Mommy! The merit goes out to you for rearing your children the proper way kahit nasa malayo ka. You're one remarkable woman! Nakaka-proud naman yan ate Kriz. I'm so happy for your kids.. Napalaki talaga sila ng maayos. Sana more medals to come pa! Yey! woohoo! look at all the medals Sis, your works really paid off, am sure that you are very proud of them :-) wtg! kids and keep it up :-)Visiting again this time can return the visit too. Thank u so much to all of u guys! Your nice words truly warms my heart!! wow! what a great achievement...money can't buy knowledge. Thank you for the visit. Sorry, just got the chance to visit you back. Have a great week!